It amazes me, and it still seems unbelievable on many levels, but Arnold Schoenberg's Violin Concerto Op. 36 - perhaps the composer's most complex and thorniest composition - has made it into the mainstream of musical culture. 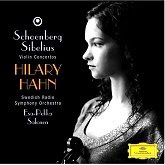 This month violinist Hilary Hahn won the Grammy Award for "Best Instrumental Soloist Performance with Orchestra" for her new CD of Schoenberg's work (Deutsche Grammophon - 477 734). The recording was also nominated for "Best Classical Album" and it debuted at #1 on Billboa rd's "classical traditional" chart. 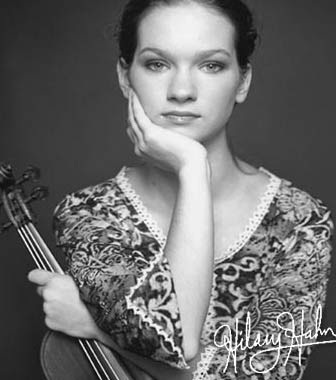 Hilary Hahn solos with the Swedish Radio Symphony Orchestra, conducted by Esa-Pekka Salonen, and all deserve a good round of applause for championing a work that conventional wisdom would say has "no commercial potential." Yet the sceptics were proven wrong on this this one, and Uncle Arnold is vindicated! On Hahn's website (and YouTube) are some interesting videos related to this groundbreaking CD. In the following video, Randy Schoenberg (grandson of the composer) asks the young violinist the same questions that Arnold Schoenberg had originally asked of Louis Krasner: the Russian-born American violinist who commissioned and premiered the concerto. (A little factoid is that Krasner was once a professor of music at Syracuse University, and coached a young clarinetist by the name of Donald Martino in chamber music). If you didn't catch it at the end of the video, Hahn says, "Perhaps he [Schoenberg] will come back and do something on YouTube." Although I did not know Louis Krasner very well, he was a great musician, teacher, and mentor at New England Conservatory. He was a major supporter of new music and of Boston-area composers. Until his death in 1995 at the age of 91, I would see him often at concerts, and we'd talk about his experience premiering pieces by Schoenberg, Berg, and Webern (he knew them all). I sure that Krasner would be very happy with Hahn's performance and her success with the piece.